Facts about Black spot tang fish. "Scientific name for Black spot tang fish is Acanthurus bariene". Black spot tang fish is native to Indonesia and Sumatra. The Black spot tang fish is also called the black spot surgeonfish, Bariene Surgeonfish, Thorntail Fish, Doctorfishes, Eye-Spot Surgeonfish, Lancetfishes, Ocean Surgeon, Roundspot Surgeonfish and Pencilled Surgeonfish. The young Black spot tang fish have more muted colors, while the adults sport deep blues, blacks and browns with orange accent marks. The adults have a black spot behind the eye, as well as dark blue stripes below the fins. You can put two or more Black spot tang fish in the tank if you maintain a one to one male to female ratio and if each fish has ample space for its own territory. 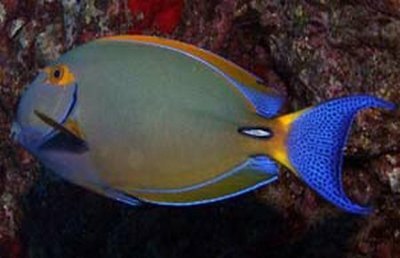 The Black spot tang fish will not be aggressive toward unrelated species of fish. Use caution when putting them in a tank with batfish, rays, sharks and foxface fish. Do not put them in a tank with pipefish or seahorses. The Black spot tang fish is semi-aggressive. They need tanks of at least 360 gallons (1362 liters), since they can grow up to twenty inches long. Ideally, the tank is six feet (1.82 meters) long or longer. The Black spot tang fish needs a lot of open space for swimming. Surgeon fish have a spine on their tales like a surgeon’s blade, hence the doctor and surgeon based names. The spines are used as a defensive weapon. The Black spot tang fish is reef compatible. They need living rock. In the wild, they would live along deep coastal reef slopes. Do not put them in a fish only tank. The ideal tank for a Black spot tang fish is between 72 F (22 c) and 78 F (25 c). The water hardness should be between 8 dKH and 12 dKH. The water pH should be 8.1 to 8.4, the standard range for saltwater fish. The specific gravity of the water should be 1.020 to 1.025. The Black spot tang fish is a Herbivore (an animal that feeds on plants). The Black spot tang fish prefer meaty foods, but they need seaweed and algae to be healthy. In fact, giving them dried seaweed held in place via a veggie clip or algae flakes improves their immune systems and lowers aggression levels. You can also supplement them with spirulina. Feed the Black spot tang fish two or three times a day with meaty foods and vegetable matter at least three times a week. When shopping for Black spot tang fish, do not buy fish that have sunken bellies. These fish may have been improperly fed or adapted poorly to captivity and refused to eat; these fish have a high mortality rate. Black spot tang fish, can actually contract “black spot disease”. Also called the black ich and tang disease, the infection caused by flatworms creates black spots on the body of the infected fish. Watch your black spot tangs for infection in the darker areas by recording behavior that indicates a desire to be rid of a parasite, but rubbing up against surfaces. If the infection is bad, the Black spot tang fish will become lethargic, eat less and its colors will fade. This member of the Acanthuridae family should not be put in a tank with other Tangs and surgeonfish.